Продукция – Veladis – Натурально, корисно, смачно! Breackout roe is exceedingly healthy, dietary product and millions of Ukrainians have already tasted it and saw its true value. Breackout roe it is salted roe which was gently rubbed through a special screen. Such roe is much more convenient to use and store, while saving all the useful properties of the fresh roe, and they are known to be a whole lot. Alaska Pollock breackout roe, cod breackout roe and capelin breackout roe presented in the ТМ "Veladis" assortment is a valuable source of the Omega-3 group amino acids which are essential for the human. There is a high content of macro- and microelements in the roe, among them is zinc, iodine, phosphorus, potassium, sodium, calcium. The vitamin kit consists of vitamins A, C, D, and also B group. The combination of health properties, excellent taste and affordable price makes screened roe from TM "Veladis" an excellent option for your breakfasts and snacks that will energize you for the whole day! Delicacy roe in sauces from TM "Veladis". We has prepared several delicatessen types of capelin roe in sauces for those who prefer more delicate taste and who looks for the original taste combinations. Herring has become an inherent product in the ration for many of us. With boiled potatoes, with onion, or simply as a separate snack, herring is one of the most popular fish in Ukraine. However, you can’t always be sure of its quality and when buying this fish in a store you have to dress and clean it before enjoying the taste. ТМ "Veladis" has already done everything for you! Fish preserves from ТМ "Veladis" are the neatly laid choicest herring fillet of the highest quality in convenient formats: 470g, 250g or 180g. Thanks to minimal processing the fish saves all the health properties and quality. You should only open the jar, inhale the aroma of spices and treat yourself and your dearest ones with your favorite herring! Atlantic salmon with Scandinavian spices. Herring fillet-pieces in oil "Matjes"
Herring fillet in oil "Matjes"
Salamuri. Silver Carp fillet-pieces in oil with onions. Everyone knows that seafood is an irreplaceable source of vitamins, minerals and a storehouse of many healthy substances which are so necessary for a human. In addition, seafood certainly can be called dietary as long as it is not overloaded with extra calories and is well absorbed by any organism. Preserves from ТМ "Veladis" guarantee preservation of everything healthy what is in the seafood. Our preserves are 100% natural, healthy and delicious products made of choicest mussels, squids, rapa whelks and shrimps of the highest quality. Rapa whelk in oil with spices "Antalya"
Meet a novelty from ТМ "Veladis" - SHRIMP PASTES! You may spread it on sandwiches or pancakes, wrap it in pita bread and if you want - just eat it with a spoon! Having appreciated the original tastes you will see how difficult it is to tear away from such a tasty treat! Meet a novelty from ТМ "Veladis" - ROE PASTES! Roe pastes are delicate combination of roe, original sauce and rich taste of shrimp, smoked squid or trout. With the roe paste the taste of your sandwiches becomes truly unique! Astonish your dearest ones with the new tastes from ТМ "Veladis"! Perhaps, salmon ikura does no need any introduction, it is a delicacy beloved by all of us, which, of course, is an ornament of any festive table. Salmon ikura from ТМ "Veladis" is a product of the highest quality, buying it you can be 100% sure of naturalness, freshness and unrivaled taste. Frozen seafood from ТМ "Veladis" is the only choicest mussels, shrimps and sea cocktail constantly of the highest quality. Thanks to the freezing and vacuum packing, our seafood keeps freshness and the whole set of healthy microelements and vitamins, which seafood are famous for. Cutlets from minced fish are very appetizing, dietary, tender dish, and it is not as simple as it seems at first glance. The main secret of successful fish cutlets is, of course, quality minced fish! In order to ensure that your fish cutlets are always delicious, keep the shape and please your dearest ones, we recommend minced fish of ТМ "Veladis"! Our mince contains only high-quality fish, prepared according to proven formulations on the newest equipment. 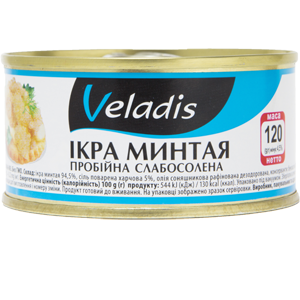 Mince of ТМ "Veladis" is a right choice for your fish cutlets!